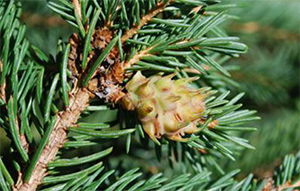 Pineapple shaped galls are formed at the base of the current year’s growth. Galls produce stunted and deformed shoots. 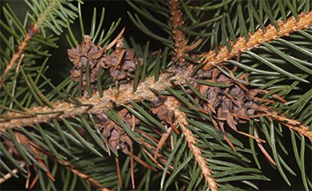 In severe infestations, many branch tips are killed and the tree becomes stunted. Old galls remain attached for long periods, turning black and making the tree look scraggly. Only female adelgids occur. The bluish-grey, oval nymphs overwinter at the bases of buds. As the buds begin to break open the females deposit 100-200 eggs at the base of the buds. The eggs are covered by a mass of white, fluffy, wax like filaments. The eggs hatch within ten days and the nymphs crawl into the new bud and start feeding on the developing needles. This stimulates the tree to form the characteristic pineapple-shaped galls at the base of the new shoots protecting the young adelgids. These galls start to turn red and open from around mid-August to October, at which time adults emerge. The winged females fly to the terminal needles of the same or nearby trees, lay masses of eggs then die. These eggs are protected by the tent-like covering of the dead mother’s wings. Nymphs that hatch from these eggs crawl to the base of buds insert their needle-like beaks and overwinter. When infestation is light, remove and destroy the galls with their contained adelgids in mid-summer. 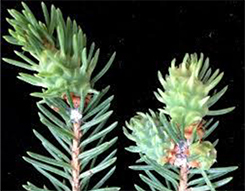 Apply horticultural oils to treat the over wintering stage when trees are dormant. Apply approved insecticides or insecticidal soap in mid-April to early May before the candles open or in October to control exposed nymphs.